The rain falling across Korea on Friday morning will cease in the afternoon and chilly fall weather will settle in after the rain, according to the Korea Meteorological Administration. 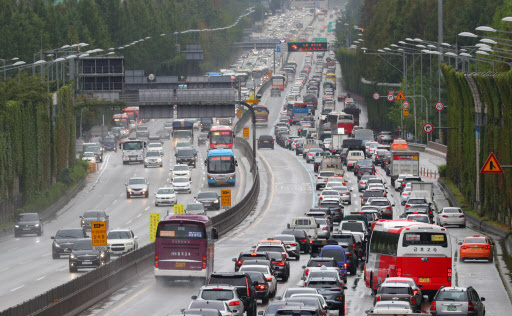 The weather agency expects the rain to stop at noon in Seoul and Gyeonggi and South Chungcheong provinces, while most parts of the country will see no rain from 6 p.m. Temperatures in the morning nationwide plunged to between 16 and 21 degrees Celsius, but will rebound to around 20 to 24 C in the afternoon. The daytime high in Seoul will record 23 C, Suwon 24 C, Gangneung 21 C, Daejeon 22 C, Gwangju 23 C, Daegu 22 C and Busan 23 C.
As clear skies are expected throughout the upcoming Chuseok holidays, residents in Korea will be able to spot the full moon on Monday.